In this video we will discuss how to pass data from the Parent component to Child component using input properties. Let us understand this with an example. At the moment the ListEmplyeesComponent displays the list of employees you see below. 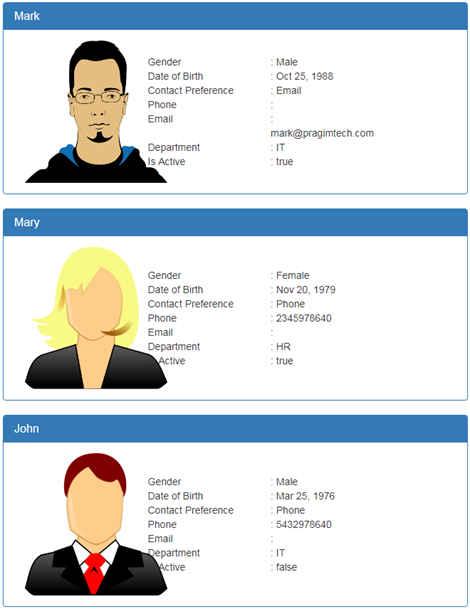 Now let's create another component and off load the responsibility of displaying employee details to that component. Let's name this new component - DisplayEmployeeComponent. Notice in the HTML above we are binding to the employee property. We need to pass the employee object from the Parent component (ListEmployeesComponent) to this Component (DisplayEmployeeComponent). To make this happen we create an input property in DisplayEmployeeComponent. So modify the code in display-employee.component.ts file as shown below. Copy and paste the following 2 style classes in display-employee.component.css file. Delete these 2 classes from list-employees.component.css. We do not need them there anymore. Make the following changes in the parent component (list-employees.component.html). Notice, the child component selector (app-display-employee) is nested in the Parent component. The parent component, loops through each employee and passes the employee object to the child component (DisplayEmployeeComponent) using it's Input property. Can't bind to 'employee' since it isn't a known property of 'app-employee-display'.